What do we mean by depth of field? In simple terms the depth of field in a picture is the area that will appear in focus. This will include an area in front of and behind the subject that you have focused the camera on. Depth of field is controlled by three things in particular: the aperture you have set, the distance to the subject and the focal length of the lens you are using. What is aperture and why does it affect depth of field? Aperture is the opening through which light is allowed into your lens and so to the camera's sensor. This is denoted by an f number (often called the f stop). The higher f number the smaller the aperture and the darker your pictures look because of the reduced light coming in. Because of the physics involved in how light coming through the opening is affected by the size of it (which I'm not going to explain in detail here), the larger the aperture used the shallower the depth of field. When comparing different types of camera, you'll find that the range of f stops available will be considerably less with a compact camera than a camera with a larger sensor size. The numbers when setting the camera are based on actual aperture size. But in reality the equivalent aperture sizes to that of a full frame camera will have a much broader range. For example f11 on a one inch sensor compact will equate to about f30 on a full frame. What aperture range is available is also dependent on what lens you are using. With compact cameras minimum aperture available usually varies as you zoom the lens, this is the same with zoom lenses used with interchangeable lens cameras. With so called prime lenses that don't zoom photographers pay a premium for 'fast' lenses which have very large apertures available. 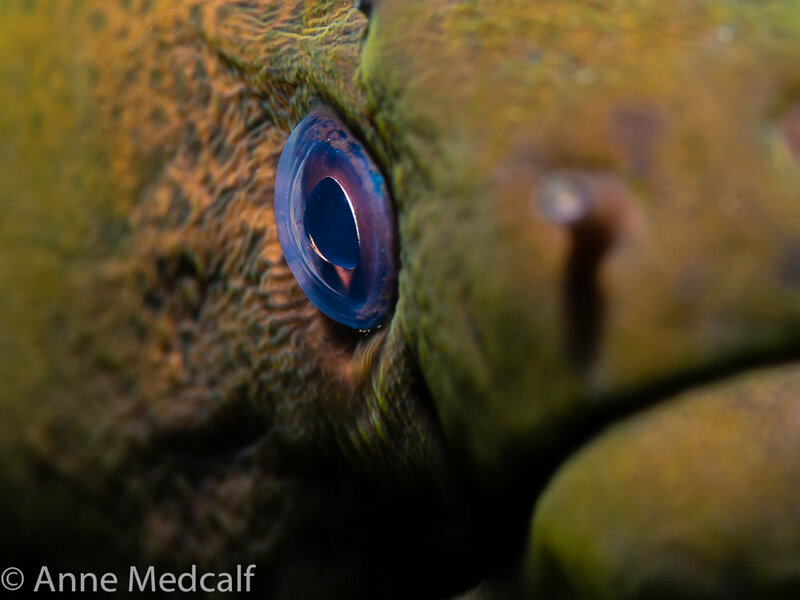 Shallow depth of field has left most of this goby's surroundings out of focus making its face what draws the eye in the picture. Bear in mind that this only applies to cameras with lenses that have a physical aperture to control light coming in. Some cameras such as the Olympus TG5 for example instead use a built-in filter to simulate aperture control. This means changing aperture on one of these cameras will only alter how exposed an image is, not the depth of field. How does distance impact on depth of field? In short the closer you are to your subject the shallower the depth of field you will have. It's often said that macro wet lenses (diopters) reduce depth of field. This isn't exactly true, instead they reduce the focusing distance which in turn means you are closer to the subject and it is this shorter distance that gives you that shallow depth of field. 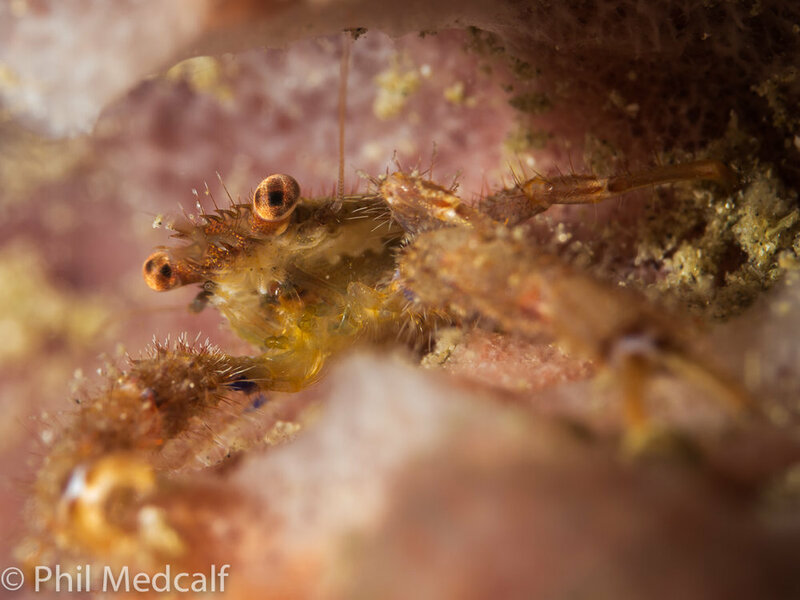 Using a powerful macro wet lens allowed me to get very close to take this image of a tiny squat lobster on a sponge. This resulted in a very shallow depth of field where only its eye and a narrow area of its body are in focus. How will lens focal length affect depth of field? Basically the longer the focal length of lens you use the less depth of field you will have. So when shooting wide angle photography you will usually have quite substantial depth of field to work with because you'll be using a short focal length lens or on a compact you'll have the lens zoomed out to it's shortest focal length. How does depth of field affect macro photography? Common advice when shooting macro underwater is to use a small aperture (high f number) in order to counteract the effects of having a short distance to subject and to a degree a longer focal length lens. This gives as much depth of field as possible for the circumstancest. It also helps alongside high shutter speed in producing dark backgrounds when using flash to light your subject. But be warned very small apertures (high f numbers) can cause lens diffraction which results in images not looking as sharp as at larger apertures. The explanation of why this happens could easily fill a blog on its own so I won't explain it here. the point at which this happens varies between lenses and cameras so it is worth playing around to find at what point it starts to occur with your setup. Obviously using a small aperture gives you more chance of getting the subject or part of the subject you are trying to photograph in focus. But using a shallow depth of field to limit what in a shot is in focus can give results that go beyond the norm. Anne used shallow depth of field in this picture of a giant moray to deal with the common problem of what to do when you have a macro lens on your camera and a big creature to photograph. A good use for this effect is to reduce how much the surroundings of a subject intrude on your shot. If the surroundings are dull and uninspiring such as the unpleasant looking sand I've mentioned in previous blogs about macro, then using shallow depth of field will result in the foreground and background being out of focus making the subject stand out better. This can work well with creatures that have similar colouration to their surroundings. You can go beyond just making the creature standout and instead opt for just a part of it in focus. Usually the eyes or in the case of nudibranchs the rhinophores (horns) make for a good feature to focus on. In this picture of a nudibranch taken in the Lembeh Straits, Indonesia I used shallow depth of field to just put the rhinophores in focus. When talking about shallow depth of field, one has to mention bokeh, originally a Japanese word. Bokeh refers to an effect that happens when using shallow depth of field where points of light in the background of a shot appear blurred and form into polygonal or nearly circular shapes. These shapes are dependent on the lens used as they correspond to the shape of the aperture formed by the blades of its iris. Bokeh is often said to be 'good' or 'bad' depending on how pleasing to the eye it is. If the blurring appears unpleasant or distracting it's 'bad bokeh'. Reviews for DSLR or mirrorless camera lenses will often refer to its ability to produce good bokeh. In underwater photography pleasing bokeh effects can be produced from strobe light reflecting off elements of your shot. At super macro sizes even grains of sand produce highlights. Or a more deliberate option is to introduce additional small lights or reflective objects in interesting colours behind the subject. Bokeh can be seen quite well in this image of a ribbon eel. Notice the polygonal shaped blurs in several places. Using a shallow depth of field has left just its eyes and part of the mouth in focus. Producing a shallow depth of field in a macro shot isn't all that hard. Increase your aperture size (reduce f number) and get close to your subject. Macro wet lenses can help by reducing focusing distance allowing you to get closer. The hard part is getting the right part of the shot in focus. This is a matter of making tiny movements with the camera and taking repeated shots. I usually use single auto focus, set the focus by pressing the shutter release button halfway and then take the shot when I think the part I want is in focus, check the picture by reviewing and zooming into it. Then repeat until I'm happy, lose patience or run out of time. Newer PostAutomatic for the People?